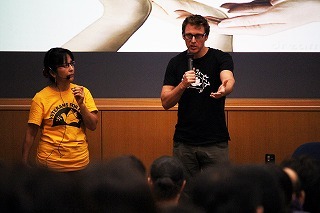 Kansai University annually holds distinctive events to promote human-rights awareness among the entire staff with the cooperation of individuals both within and outside the university. 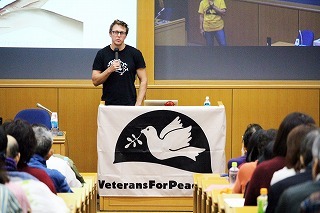 As part of this, a special lecture entitled "American Military Empire and Okinawa, Peace Movement by Veterans" by Michael Hanes, a veteran from the Iraq War, and Rachel Clark, both of whom are members of the Veterans For Pease (VFP), was held at Senriyama Campus on November 30. Hanes began his lecture by talking about the war history of the United States and expressed an apology to victims of wars, followed by offering silent prayer with the audience at the venue. He then explained how he had joined the Marines. In the U.S., many children, receiving a patriotic education in their childhood, admire heroes through watching movies and animations such as Rambo and Captain America, in which soldiers are described as heroes, and Hanes had the same background. He fought in the Iraq War, and through being exposed to destruction, pain and suffering on a daily basis he found himself wondering if his own actions amounted to those of a terrorist despite coming to Iraq to repel terrorists. After returning from the war, he became a recluse, suffering from the terrible experience of the war for years, but engaging in agriculture made him rejoin his community. Since then, he has joined the VFP and visited Jeju Island, Okinawa and Palestine to protest against military action. He claimed he would go anywhere around the world to struggle for peace with local residents. In the end, he concluded with his message that our future is unwritten: it is up to us to write it. The important thing is to combine our voices in calling for peace. He concluded by declaming "no more war!" 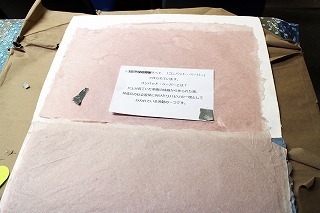 After the lecture, Rinako Koide, a second-year student in the Faculty of Letters, said it was a good opportunity for her to take her thinking about peace one step further by listening to the voice of someone who had been on the ground in situations not introduced in news or movies. She said she would convey what she learned to as many people as possible, which would be the first thing she can do to promote peace at the current time.